Global economic and insurance industry losses from natural catastrophes in the first-half of 2017 have both come in way below average, with just $19.5 billion hitting re/insurers which is significantly below the $29 billion ten-year average, according to data from reinsurance firm Munich Re. 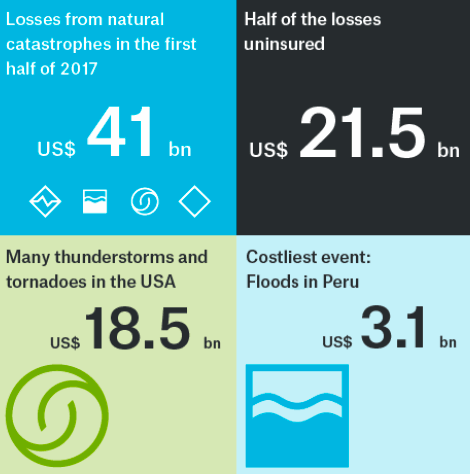 Munich Re has released its latest view of global natural catastrophe loss events and how they have affected the insurance and reinsurance industry today, highlighting that loss levels remain far below average expectations, which will only serve to maintain the pressure on all important reinsurance pricing as industry levels of capital will remain high. Overall economic losses caused by natural catastrophes in the first-half of 2017 came to $41 billion, which is significantly below the $111 billion suffered in H1 2016 and also the ten-year average of $102 billion. The total loss suffered by insurance and reinsurance capital is estimated as $19.5 billion, by Munich Re, again well below the $32 billion from H1 2016 and the ten-year average of $29 billion. Given the major driver of insured loss during the first-half of this year has been U.S. severe thunderstorms and severe convective weather, a higher proportion of the economic loss was covered by insurance than is usually seen. In fact, more than half of the total loss has fallen to the insurance and reinsurance industry as the U.S drove the economic impact in H1 2017, compared to over two-third being uninsured in the previous year and the average. A U.S. thunderstorm in May was the largest single insured loss event of the first-half of the year, with insurance and reinsurance markets paying for $1.8 billion of a $2.2 billion loss event. 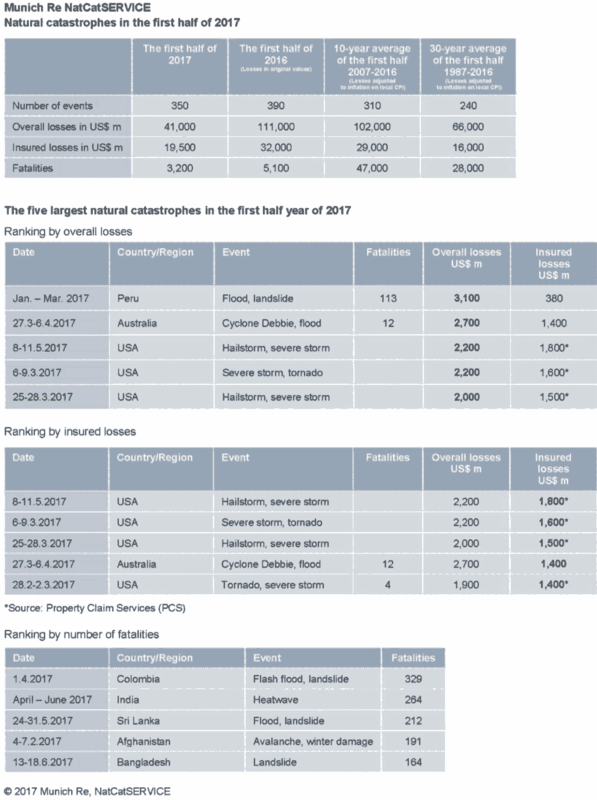 U.S. severe thunderstorm events were responsible for three of the five costliest loss events around the globe in the first half of 2017, with each event causing economic losses of over US$ 2bn. The total economic loss from these storms reached US$ 18.5 billion, of which US$ 13.5 billion was insured. The level of insurance and reinsurance industry losses has been particularly low around the globe, while U.S. losses from the severe thunderstorm peril are closer to the average. Hence the insurance industries share is higher than is sometimes seen, but at a below average level due to the relatively benign level of global losses from natural disaster events. At a time when global reinsurance capacity continues to climb to new record highs, the levels of loss revealed in Munich Re’s estimates will not provide any hope of eroding the surplus that is impacting the sectors ability to harden pricing.